Double-lumen endotracheal tube (DLT) placement is the most common technique to achieve lung separation. The lungs are paired organs interconnected by bronchi and trachea that function as one unit. However, isolation of one side from another may be required to optimize visualization for certain surgical procedures within the thoracic cavity, such as operations on the lung tissue, esophagus, mediastinal structures, thoracic vasculature, and thoracic spine. Additionally, lung isolation allows for management of certain pathological conditions of the lung including unilateral lung hemorrhage, infection, trauma, bullous disease, or bronchopleural fistula. The DLT, comprising two parrallel lumens, is placed through the vocal cords into the trachea with the shorter tracheal lumen terminating in the trachea, and a second, longer lumen extending into either the left or right main bronchus. Each lumen has a cuff that is inflated to create a seal. This allows the clinician to ventilate both lungs or the right or left lungs independently. [1, 2, 3, 4] The ventilated lung is referred to as the dependent or non-operative lung. A DLT is designated as either left or right, depending on which bronchus the bronchial lumen is designed to terminate in. Left-sided DLTs are used more frequently as they are significantly easier to place without obstructing the upper lobe bronchus. 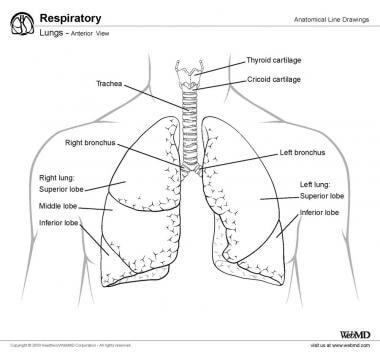 A right DLT includes an orifice along the bronchial tube to align with and ventilate the RUL. The image below depicts a double-lumen endotracheal tube. However, because of their significantly larger size and stiffness, DLTs have a higher propensity for trauma after insertion, may be challenging to place in patients with difficult airways, and are not intented for post-operative ventilation. In addition, right-sided DLTs are difficult to place without obstructing the right upper lobe bronchus. Lung anatomy includes the lung parenchyma, which carries part of the conduction system but is mainly involved in the gas exchange at the alveolar level. The lung parenchyma is further subdivided into lobes and segments. See the image below. The trachea is nearly but not quite cylindrical, flattened posteriorly. In cross-section, it is D-shaped, with incomplete cartilaginous rings anteriorly and laterally, and a straight membranous wall overlying the trachealis muscle that runs longitutidinaly along the posterior wall of the trachea. The trachea measures about 11 cm in length and is chondromembranous. This structure starts from the inferior part of the larynx (cricoid cartilage) in the neck, opposite the 6th cervical vertebra, to the intervertebral disc between T4-5 vertebrae in the thorax, where it divides at the carina into the right and left bronchi. The bronchus (from Greek bronkhos "windpipe") is the part of the respiratory system that connects the trachea to the lung parenchyma. It is composed of an extensive branching system of airway passages that transmit the air from the atmosphere to the alveoli (the gas-exchange units). The right main bronchus is shorter and steeper than the left, with its upper lobe branch take-off occuring closer to the carina. Knowledge of the tracheal-bronchial anatomy and it's endoscopic appearance is vital for successful placement confirmation with the bronchoscope. For more information about the relevant anatomy, see Lung Anatomy, Trachea Anatomy, and Bronchial Anatomy. A left DLT is most commonly used as it avoids inadvertent obstruction of the right upper lobe (RUL) bronchus that can occur with a right DLT. Right-sided tubes may be required for left pneumonectomy, left lung transplant, or when there are anatomical distortions of the left main bronchus. DLTs are sized by their external diameter measured in French Guage, and are available in 35 Fr, 37 Fr, 39 Fr, and 41 Fr for adults, and 26 Fr, 28 Fr, and 32 Fr for children. Traditionally, and still most commonly, gender and height are used to select DLT size, however, this alone may lead to frequent under or over-sizing of the DLT. Roldi and collegues report a 60% incidence of missized DLTs with height/gender correlation alone. Use of tracheal or bronchial diameter measurements from plain film, comuted tomography, or ultrasound modalities has been suggested to improve accuracy of sizing by some,  while others show poor correlation. Hence debate still exists in best method of DLT size selection. An optimally sized DLT is the largest tube to fit easily into the main bronchus while still allowing a leak around the tube with the bronchial cuff deflated, and not requiring more than 3mL (or manufacturer's recommendation) of air to the bronchial cuff to create a seal. DLTs that are too large or small can lead to airway trauma, malpositioning, or suboptimal lung isolation. For pediatric patients, size is chosen by age: 26 Fr for 8–10yrs, 28 Fr for 10–12yrs, and 32 Fr for 12–14yrs. A study by Seymour et al. showed that the mean diameter of cricoid ring is similar to main stem bronchus. Therefore, if the tube cannot be advanced easily through that part of the airway, it is probably too large and should be changed for a smaller one. Good preparation is important for a smooth and uneventful intubation process. Therefore it is important that tubes of one size smaller and larger are readily available during the procedure. The most common method of placement involves direct laryngoscopy to intubate the trachea, followed by blind advancement to achieve endobronchial intubation. The distal, bronchial tube is held with the tip directed upward. As it passes through the glottis, the stylet is removed and the tube is advanced and rotated 90 degrees (towards the side to be intubated) until resistance is felt; this depth is usually between 28 and 30 cm. At this point the bronchial lumen should be sitting within the bronchus, with the tracheal lumen above the carina. The tracheal cuff is inflated, and ventilation is provided through both lumens. Chest rise, breath sounds, and end-tidal CO2 on the capnogram all tell the clinician that the tube is in the airway. At this point, correct tube placement is verified via bronchoscopy (see position verification). After the tube is placed, its placement should be confirmed. Although sequential auscultation is the traditional and widely available method, it is not as accurate as fiberoptic examination, which is preferred. After placement of the double-lumen endotracheal tube, the tracheal cuff is inflated and ventilation through both lumens is attempted. The patient should have bilateral breath sounds. Next, the bronchial cuff is inflated, the tracheal lumen is clamped, and bronchial lumen ventilated. One-sided breath sounds should be heard, only over the desired lung field. Next, the tracheal lumen is unclamped and reconnected, the bronchial lumen is clamped, and ventilation is attempted through tracheal lumen. If the tube is positioned correctly, breath sounds should be heard over contralateral hemithorax only. Then the bronchial lumen is unclamped and reconnected and bilateral breath sounds should be audible again. This concludes auscultation for correct placement. Auscultation is not very reliable, however. Smith et al. showed that 48% of blindly placed double-lumen endotracheal tubes were malpositioned. Another study by Alliaume et al. showed that malposition was present in 78% of left-sided double-lumen endotracheal tubes and 83% of right-sided double-lumen endotracheal tubes. Auscultation should always be supplemented with fiberoptic evaluation and repeated each time the patient is repositioned. The flexible, fiberoptic bronchoscope is first passed through the bronchoscopy port down the tracheal lumen. The tracheal lumen should terminate above the carina, and the bronchial lumen should be seen entering the intended bronchus, with the blue bronchial cuff just visible below the carina. Knowledge of tracheal bronchial anatomy is essential to identify landmarks and orientation. The bronchoscope is then removed from the tracheal lumen and passed down the bronchial lumen to confirm patency and correct location. In the case of a right DLT, the RUL orifice in the bronchial tube should be assessed to align with the RUL bronchus. If the double-lumen endotracheal tube is malpositioned, it may be in the correct bronchus but too deep, in the correct bronchus but too shallow, or in the wrong bronchus. The table below presents physical examination findings for both correct and incorrect positions. In addition to physical examination findings, bronchoscopy is of great value in troubleshooting tube malposition and will help to position the tube. Even a correctly placed tube can relocate at any time. Surgical maneuvers and patient repositioning can result in tube dislodgement, which can manifest as sudden change in compliance and airway pressures and decrease in tidal volume. Again, physical examination and fiberoptic verification should be undertaken and correct placement of the tube confirmed or changed if necessary. Right-sided double-lumen endotracheal tubes are designed differently because the right bronchus is shorter than the left bronchus. These tubes have a cuff with a slot in it to facilitate right upper lobe ventilation. The right-sided tube is much more challenging to place. Most of the failures in correct placement stem from not confirming the placement after the patient is moved. de Bellis M, Accardo R, Di Maio M, Lamanna C, Rossi GB, Pace MC, et al. Is flexible bronchoscopy necessary to confirm the position of double-lumen tubes before thoracic surgery?. Eur J Cardiothorac Surg. 2011 Oct. 40(4):912-6. [Medline]. Gaillat F, Duponq R, Chabert L, Charvet A. Double-lumen tube intubation systematic verification with fiberoptic bronchoscopy: between what who should do and what we can do. Eur J Cardiothorac Surg. 2011 Oct. 40(4):917-8. [Medline]. Campos JH, Massa FC. Is there a better right-sided tube for one-lung ventilation? A comparison of the right-sided double-lumen tube with the single-lumen tube with right-sided enclosed bronchial blocker. Anesth Analg. 1998 Apr. 86(4):696-700. [Medline]. Abel M., et al. Lung Isolation in a Patient with a Difficult Airway. Cohen H. N. Medically Challenging Patients Undergoing Cardiothoracic Surgery. Lippincott Williams & Wilkins; 2009. 267-284/10. Campos JH. Current techniques for perioperative lung isolation in adults. Anesthesiology. 2002 Nov. 97(5):1295-301. [Medline]. Anesthesia for Thoracic Surgery. Barash PG, Cullen BF, Stoelting RK, Cahalan MK, Stock MC. Clinical Anesthesia. 6th Edition. Lippincott Williams & Wilkins; 2009. Chapter 40. Anesthesia for Thoracic Surgery. 8. Miller RD, Erikkson LI, Fleisher LA, Wiener-Kronish JP, Young WL. Miller’s Anesthesia. 7th Edtion. Churchill Livingstone Elsevier; 2010. Vol 2: Chapter 59. [Guideline] Morgan G E., et al. Anesthesia for Thoracic Surgery. Marc Strauss, Harriet Lebowitz & Peter J. Boyle. Clinical Anesthesiology. 4th. Lange Medical Books/McGraw-Hill Medical Publishing Division; 2006. 585-613/24. Roldi E, Inghileri P, Dransart-Raye O, Mongodi S, Guinot PG, Mojoli F, et al. Use of tracheal ultrasound combined with clinical parameters to select left double-lumen tube size: A prospective observational study. Eur J Anaesthesiol. 2019 Mar. 36 (3):215-220. [Medline]. Hannallah M, Benumof JL, Silverman PM, Kelly LC, Lea D. Evaluation of an approach to choosing a left double-lumen tube size based on chest computed tomographic scan measurement of left mainstem bronchial diameter. J Cardiothorac Vasc Anesth. 1997 Apr. 11 (2):168-71. [Medline]. Ideris SS, Che Hassan MR, Abdul Rahman MR, Ooi JS. Selection of an appropriate left-sided double-lumen tube size for one-lung ventilation among Asians. Ann Card Anaesth. 2017 Jan-Mar. 20 (1):28-32. [Medline]. Seymour AH. The relationship between the diameters of the adult cricoid ring and main tracheobronchial tree: a cadaver study to investigate the basis for double-lumen tube selection. J Cardiothorac Vasc Anesth. 2003 Jun. 17(3):299-301. [Medline]. Cheong KF, Koh KF. Placement of left-sided double-lumen endobronchial tubes: comparison of clinical and fibreoptic-guided placement. Br J Anaesth. 1999 Jun. 82(6):920-1. [Medline]. Ovassapian A. Fiber-optic Endoscopy and the Difficult Airway. 2nd ed. Philadelphia: Lippincott-Raven; 1996. pp 117-156. Smith GB, Hirsch NP, Ehrenwerth J. Placement of double-lumen endobronchial tubes. Correlation between clinical impressions and bronchoscopic findings. Br J Anaesth. 1986 Nov. 58(11):1317-20. [Medline]. Alliaume B, Coddens J, Deloof T. Reliability of auscultation in positioning of double-lumen endobronchial tubes. Can J Anaesth. 1992 Sep. 39(7):687-90. [Medline]. Seo JH, Hong D, Lee JM, et al. Double-lumen tube placement with the patient in the supine position without a headrest minimizes displacement during lateral positioning. Can J Anesth. 2012 Feb 25. [Epub ahead of print]. Heir JS, Guo SL, Purugganan R, Jackson TA, Sekhon AK, Mirza K, et al. A Randomized Controlled Study of the Use of Video Double-Lumen Endobronchial Tubes Versus Double-Lumen Endobronchial Tubes in Thoracic Surgery. J Cardiothorac Vasc Anesth. 2018 Feb. 32 (1):267-274. [Medline].